Font __ | The Font used to display the text. | |Font Style__ The style applied to the text. The options are Normal, Bold, Italic and Bold And Italic. Color 텍스트를 렌더링하는 데 사용할 색상. Some controls (such as Buttons and Toggles have textual descriptions built-in. 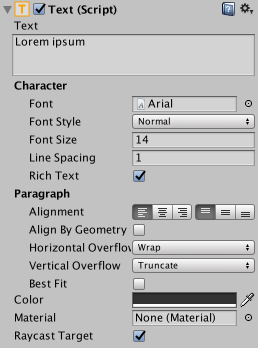 For controls that have no implicit text (such as Sliders, you can indicate the purpose using a label created with a Text control. Text is also useful for lists of instructions, story text, conversations and legal disclaimers.